Today’s older generation with clear memories of the last century will recognise the important part “the news” played in their lives. It was the golden age of news coverage, with every medium working overtime – literally – to carry the latest news, and hopefully be first with it. The present generation don’t have it that good. Sure, there is plenty of information masquerading as news, but when an on-line news provider has to attract attention by posting The Ten Top Pictures Of Cats on its front page, pessimism seems justified. It seems the young generation have to be tricked into digesting news. So the news habit is in danger of dying out. Under-nourished by a constant stream of stuff from social media, the hope that today’s children and grand-children will acquire the news habit – that daily urge to catch up with an authoritative version of world events – appears remote. Indeed, it is hardly encouraged by the BBC’s decision to cut back its flagship Ten O’Clock News. In effect, the next generation is in danger of being deprived of the very news they need to understand the world. Which is why two publications that drop through thousands of UK letter-boxes every week are significant. 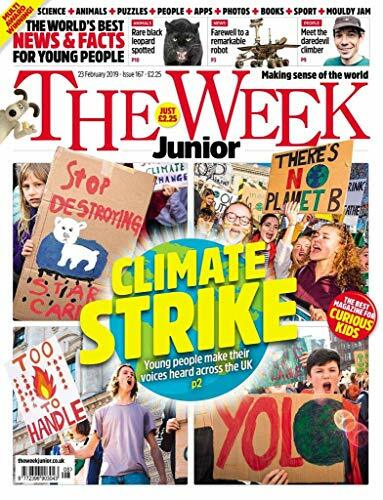 The Week Junior and First News seem to offer a chance of turning the tide of non-news engulfing our children. Both publications carry a dazzling collection of current stories, without sidestepping the serious, the controversial, the troubling. In recent editions, that has included everything from the current chaos in Venezuela to the latest Lego movie, from plastic road surfaces to wild boar hunting for food in the streets of Rome. One week early in the New Year, both publications chose the same lead story – the record-breaking weather round the world, from the phenomenally low temperatures in the US to the scorching heat in Australia. And both selected dramatic pictures, guaranteed to excite the interest of readers. But the two publications are more than just notice-boards for great pictures and a simple story-line. First News, for example, recently launched a campaign to help the 121 million school-aged children across the world who are not getting an education. The same edition included celebrity news, sport – and an entire page devoted to the many unusual words that Shakespeare used or made up, and which are no longer in use. Stories about crime or disasters require sensitive treatment, to avoid young readers becoming anxious or afraid. And nothing better illustrates the constant need to balance good and bad news than the launch of The Week Junior. It was November 2015 and the magazine was ready to hit the news-stands with a colourful, fun-filled first edition. But shortly before the launch, terrorists carried out a series of co-ordinated attacks in Paris which resulted in the deaths of 130 people, including many at a pop concert in the Bataclan Theatre. It was a story the magazine could not ignore, nor consign to a down-the-page treatment. The danger of children interpreting the news incorrectly is recognised by First News, and dealt with in a very direct way. “Things that happen in the news will be talked about in the school playground or lunch hall, or in online chats. Better that you know the real facts, rather than hearing exaggerated or confused versions from other people. You need correct information, not misinformation”. BBC presenter Jeremy Vine is a big fan – “such a brilliant way into the world of news”. No generation so far has settled on the perfect template for presenting news in a way that has universal appeal. It is probably an impossible dream. But how ironic that one avenue of help for the young has arrived courtesy of the oldest news medium of all – print.